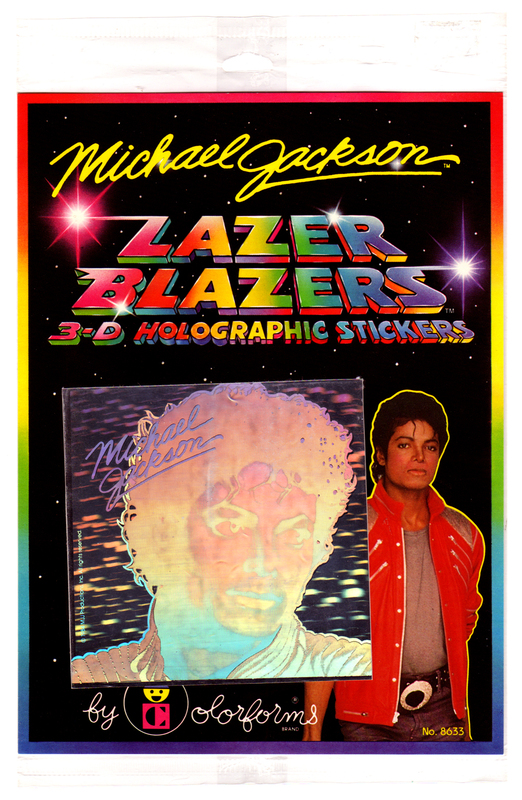 I forgot to mention while talking up my visit to Bizarro Wuxtry this past weekend, that of all the stuff Devlin had in his store the thing that amazed me the most was that he had a handful of 80s stickers for sale. 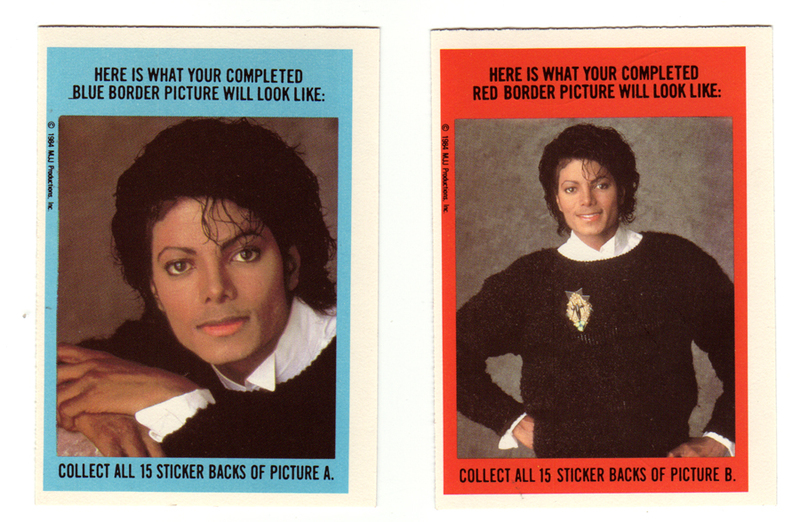 While I’ve been looking for a place that sells 80s era ephemera, magazines and the like, I’ve really wanted to find at least 1 set of stickers, or at least some original Garbage Pail Kids or something, and he had both. Not a large selection, but it was certainly heartwarming to find anyway. 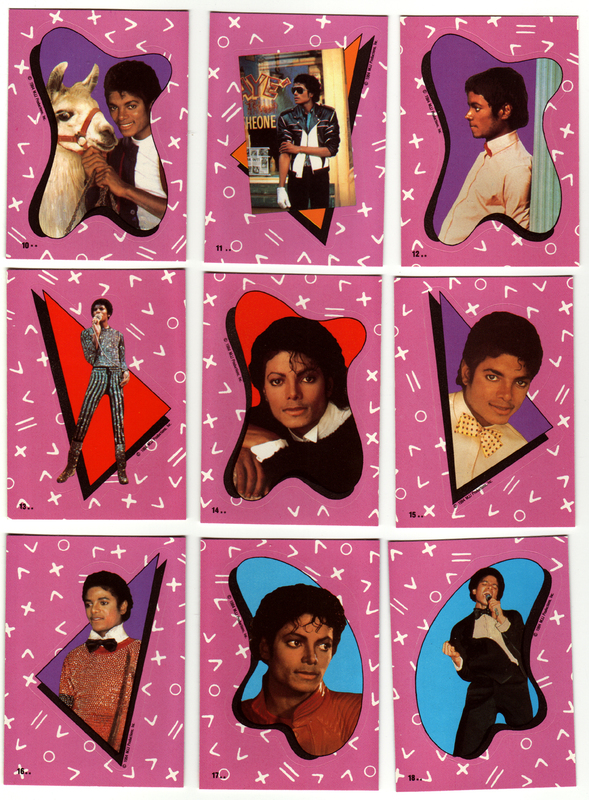 Well, this week on Peel Here I’m finally going to share my collection of Michael Jackson stickers, which as I’ve said, is a much larger one than I ever thought I’d end up with. 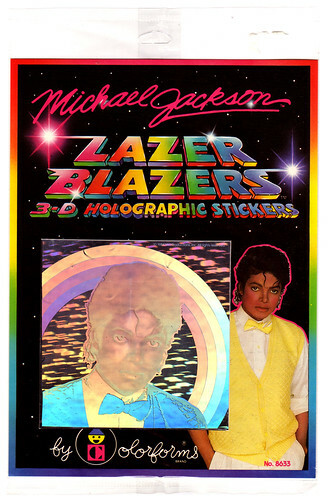 Mr. Moonwalker made up a pretty big portion of my musical influences around the age of 7, and even though I was never sucked in to the creepy extent that Macaulay Culkin or Corey Feldman were, I did have my a few bits of Michael Jackson schwag. The two things I remember the most were a cheap record store knock-off white, sequined glove and a horrible white, cut-off sweatshirt that looked like it was torn away to reveal a couple hairy fingers, some yellow cat eyes, and had the word Thriller above it in a gaudy green and yellow airbrushing. 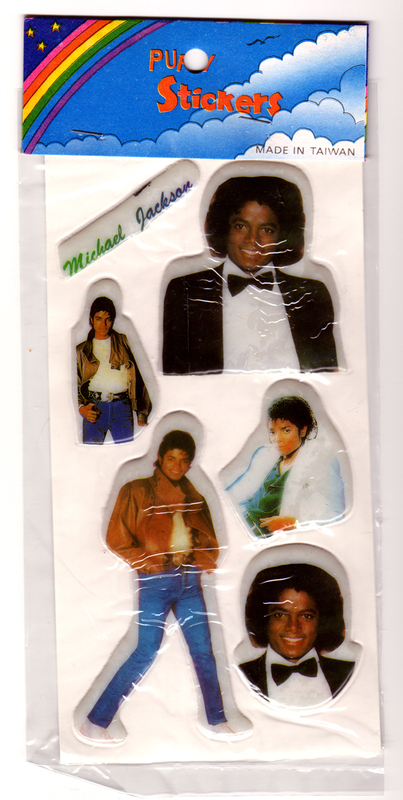 Now I have seen some more officially licensed puffy stickers, but these are pretty much the exact same stickers only in a very bootlegged looking package. These stickers are actually a nice representation of the transition that the King of Pop was going through during the late 70s and early 80s, starting with 20 something afro Jackson, going through early 80s clean cut Jackson, and on to the 1984 Thriller era wet-hair Jackson. I also really dig that since the afro picture was so cool, it had to be repeated. 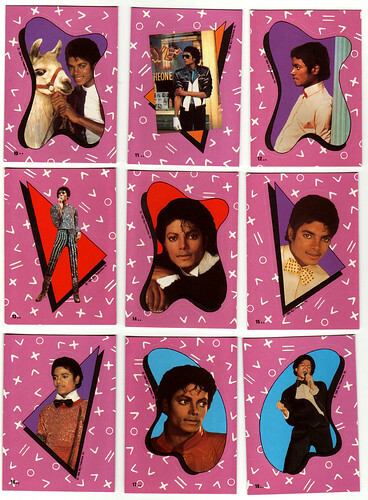 Now for something a little crazier and a little more official, here is the complete first series of the 1984 Topps Michael Jackson sticker cards. There were 33 cards in this set, which could be purchased in either packs, or in a carded set. The stickers themselves have two variations, one with the Topps copyright and one with just the MJP text, but both are the same. 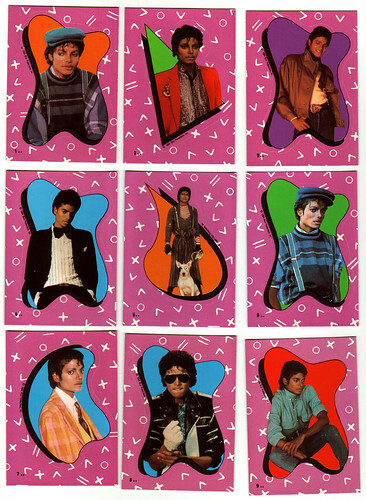 I don’t think I’ve shared any stickers that quite scream "designed in the 80s" like these sticker cards do, from their wacky shaped die-cuts, to the miscellaneous symbols in the background. The second card series is even worse as the BG is mint green, a much more 80s fad in terms of color. 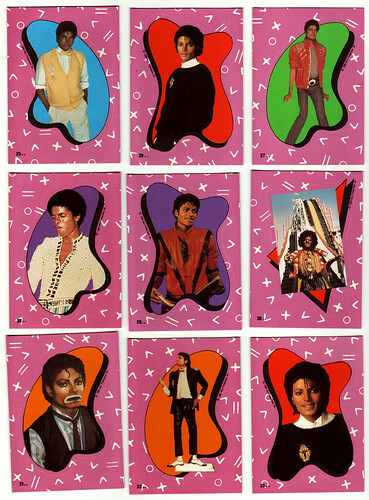 If the puffy stickers exhibited a nice transition of his style in terms of going from sort of normal looking to his more patented freaky appearance, these sticker cards are ten times better. 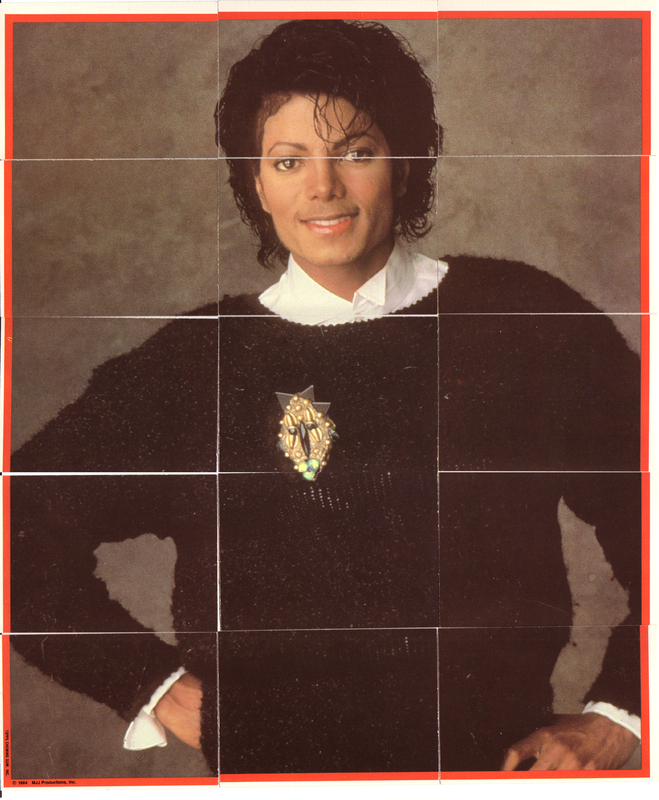 They manage to capture almost every aspect of his style, from the glitter jumpsuits to his freakish Llama fetish and his white glove to his mastery of wearing bow ties with a sweater. There was even a shot with his monkey, Bubbles. I wonder how many personally owned moneys have been stuck with that moniker since? By far though, and the reason I bought this set in the first place was for the inexplicably awesome Sad Clown Jackson sticker. Is there a better image of Michael Jackson? When the hell did this come up in his day-to-day entertainment life, I mean what urged him to rock the sad clown? I think I missed that day of MTV or something. 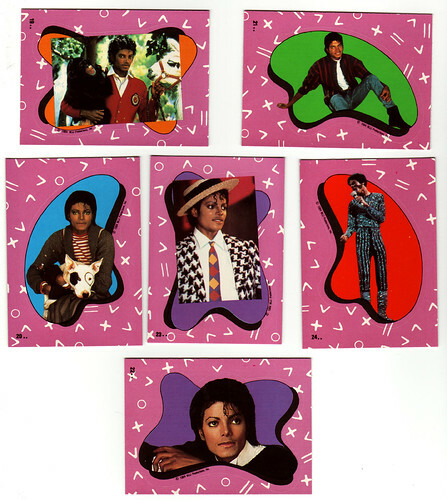 To round things out for this set we also get a shot of Jackson as the Scarecrow from the Wiz. 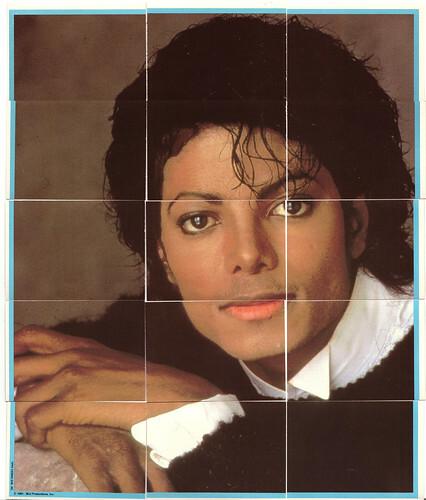 It’s kind of sad really, I thought that I would have a lot more to say, at least more funny things, but ultimately, I guess pretty much all of my love for the Smooth Criminal ended when I turned 10 and my musical interest shifted from easy listening Pop to Metallica and speed metal. Considering his downward spiral of self parody, and somewhere down the line, his buying into the whole god-like stature I’ve just never been able to get back into him, not even really in a kitsch kind of way. I do remember being impressed by his self-parody on an early season of the Simpsons, though only a little. 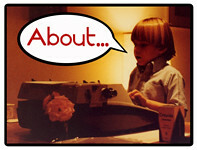 Oh where or where is my 7 year-old self when I need him? Next week on peel here, Jayce and the Wheeled Warriors fight the evil Saw Boss and the Monster Minds!